Fix and Forget Friday is brought to you today by Mindy from The Purposed Heart. All of Mindy’s recipes rock my face off, so I know you’re going to LOVE these! We love sloppy joes at our house. They’re such an easy and economical meal, and they also happen to be delicious! Well, except for that time that I thought I would be sneaky and use half ground beef and half ground liver – they weren’t so delicious that time. I know that liver is good for you and all, but I just can’t get past the taste or the smell of it. Yuck! If you like liver – go you! Eat it up, because it is super nutritious and good for you. 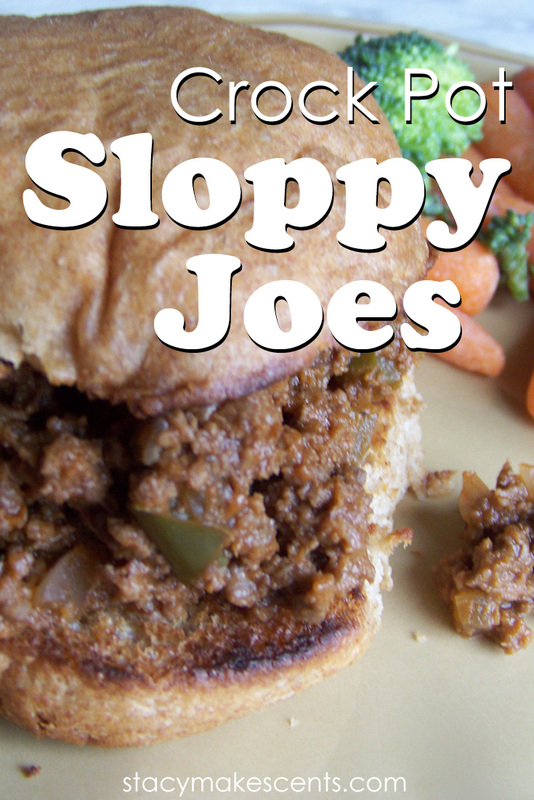 So besides the sneaky liver sloppy joes, I’ve never had a sloppy joe that I didn’t like. And this recipe is no exeption! It’s so easy to throw together, and the taste is far better than any sauce that you could buy from the store. If you have time, you should also try making some homemade buns to go with your homemade sloppy joes! Stacy has a great recipe for homemade buns that I highly recommend – they’re awesome! They’ll take your sandwiches from yum to YUM! Brown ground beef in a large skillet with the onion and green pepper. 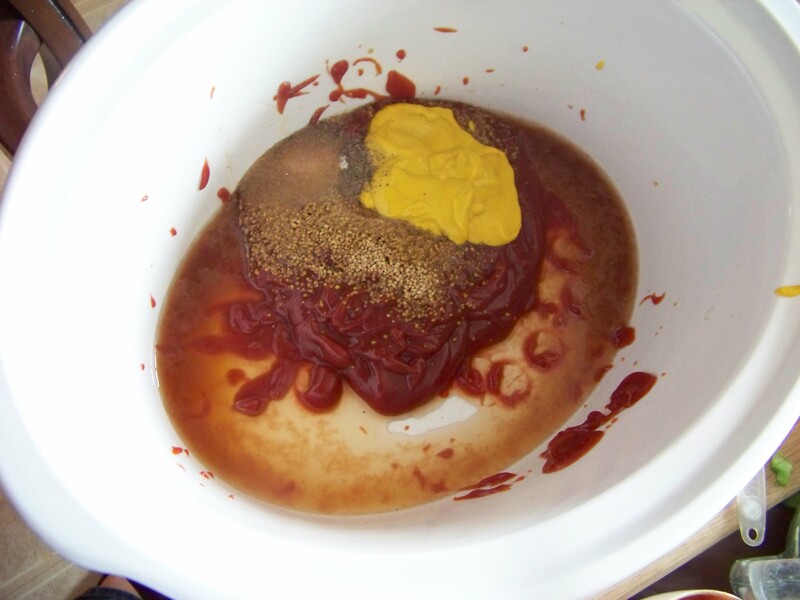 Add browned ground beef mixture along with the remaining ingredients to the crock pot. Mix well to combine. Cook on low for at least 3 hours, but up to 6 hours. 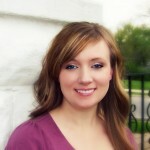 Mindy is a wife and mama who loves everything about experimenting in the kitchen (except for the dishes part!). You can find more of her favorite recipes on her blog, The Purposed Heart. Can this be frozen, before and/or after cooking? Yes! I freeze cooked sloppy joes all the time. I grind up carrots and sneak a vege into my sloppy joes. I have a question? If 6 hrs is the max time for the recipe. How do I handle these types of recipes when I’m at work for at least 9hrs a day. I could get a timer for the crock pot but can the ingredients sit in there for 3hrs before it starts to cook? A lot of people do use timers like that – Christmas tree light timers work well. I would cook it first and then switch it to low. Even then, you might end up with some crispiness around the edges for this particular recipe. I used to be gone from home for 12+ hours on workdays… a great trick I figured out was using the “warm” setting on my crock pot. If something was to be cooked 8-9 hours on low, I could easily cook it 12-14 hours on warm without overcooking. I would think 9 hours on warm would probably be fine for this recipe. How many servings would you say this makes? Around 8-10? These are delicious! Buns are in the oven…going to have a happy, healthy family tonight! Homemade buns are the BEST! You’re a crockin’ queen lately! I was going to make meatloaf but after reading this, it’s sloppy joe night. I’m going to throw in a little liver though. I grind it up in the food processor to a paste and mix in about 1/4 cup If you start with a small amount you won’t even know it’s there, especially with all the other flavors going on. You’re welcome here anytime, Mindy! Oddly enough, the Friday night dinner space on our meal schedule this week is empty. Plus we have all these ingredients! Looks like sloppy joes for dinner! Thanks Stacy and Mindy! YUM! i wanna eat this right now! i LOVE me some sloppy joes. we always have leftovers that i use to make cornbread joe pie. bake your fave cornbread recipe until almost done, cover w/sloppy joe mixture, top w/shredded cheddar and bake until bread is done and cheese is melted. fabulous!!! Sloppy Joes are where it’s AT. Thanks for the sloppy cornbread joe pie recipe, Sherrie! I want to try this! 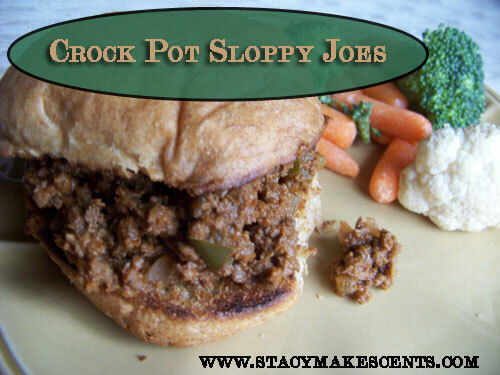 Great idea to make sloppy joes in the crock pot! For some reason, I never thought of doing that! 🙂 Mindy is a smart cook! That would be so nice to throw together and take to a family in need… for instance, after a baby is born, etc. Yummy!